Now, they made it into a show on Nickelodeon. Olivia is so sweet, and funny. 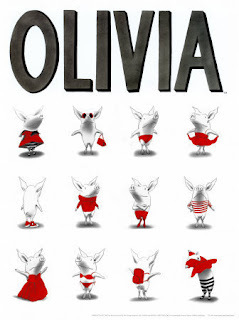 I am assuming that this was based off of a real Olivia, or at least I hope so. I hope that a child exists with this much personality! I especially love it when she imparts her "life lessons", such as "Rule #452: When your mom is having a baby, and asks you whether you want a brother or sister....you don't always get what you want." This is especially poignant, since just yesterday, I asked Avery whether she wanted mommy to have a little brother or a little sister...and she said "Little Brother". Then, I asked her what she wanted to name her little brother and she said "Sister". So, according to Avery, she will be having a little brother named Sister. Sorry kid...you don't always get what you want. Now tell the truth: is "Sister" better or worse than "Cletus the Fetus"?